Maccabi Electra Tel Aviv rallied back from a 17-point second-quarter deficit to beat Zalgiris Kaunas 70-66 in a thriller at Nokia Arena on Thursday night. Keith Langford scored 17 points, including a clutch layup with 24 seconds remaining and Richard Hendrix totaled 11 points – including a free throw to ice the game with 7 seconds left – plus 9 rebounds and 2 blocks as Maccabi swept the season series from the Lithuanian champs. Zalgiris rolled from the start. A 0-8 start to the game grew to an 11-25 lead after 10 minutes thanks to a red-hot Sonny Weems and a 17-point gap early in the second quarter. 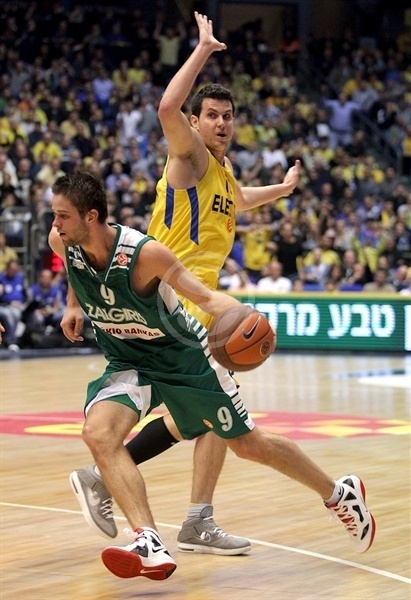 Theo Papaloukas sparked a 12-0 run to bring Maccabi back to 33-37 by halftime. Zalgiris fended the hosts off in the third quarter, but Maccabi heated up from long distance to take the lead in the fourth. The game came down to the wire and Weems had two looks from downtown to tie the game at the end, but was blocked once by Devin Smith and missed the second as the Israeli champs claimed the win. 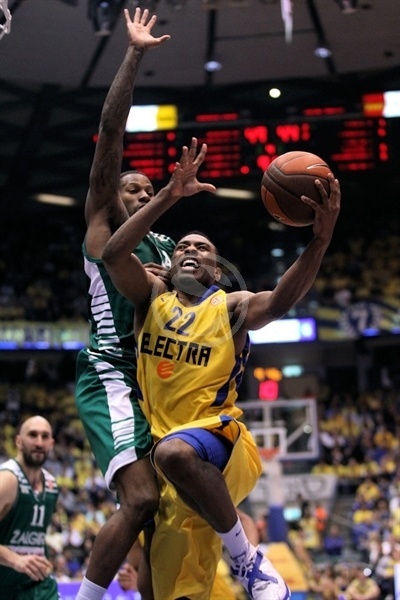 Sofoklis Schortsanitis added 11 points and Papaloukas totaled 7 points and 7 assists for the winners. Weems led Zalgiris with 20 points, Dainius Salenga scored 12 and DeJuan Collins 11 in defeat. Zalgirs won the opening tip and attacked the basket immediately as Salenga scored the game’s first points through a goaltending call after just 3 seconds. Paulius Jankunas and Weems lifted Zalgiris to 0-8 before Lior Eliyahu scored a basket-plus-foul for the hosts’ first points after more than three minutes of game time. That basket did not stop the visitors’ momentum as Salenga and Jankunas connected from behind the arc to give Zalgiris a promising 3-14 lead and just as important, silencing the raucous Maccabi crowd. Schortsanitis scored a second-chance basket, but Mantas Kalnietis went through the Maccabi defense for a three-point play and a 5-17 lead midway through the quarter. Maccabi started to work itself – and the crowd – back into the game through Tal Burstein free throws and a Schortsanitis hoop. But after Weems provided a highlight, DeJuan Collins hit a pair of triples to up the lead to 11-25 through 10 minutes. After a series of tips failed to make the basket, Zalgiris countered on the break with a Weems slam. Then a Langford jumper was bettered by Weems with a three for a 13-30 Zalgiris lead. 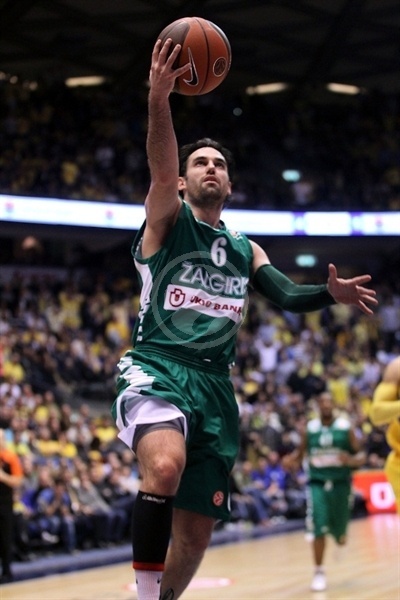 Papaloukas looked to jumpstart the frosty Maccabi attack with a three-pointer. After Guy Pnini penetrated for a layup, Zalgiris coach Aleksandar Trifunovic called a timeout. However that didn’t reverse the momentum as Papaloukas threw in a lefty layup to trim the deficit to 10. A Langford three made it a 10-0 Maccabi run and brought about another Zalgiris timeout. Milovan Rakovic took a seat with his third foul Javtokas sent in a baby hook to end the Zalgiris drought after nearly four minutes and then Marko Popovic added a triple to restore a 10-point lead. Papaloukas attacked the basket and Langford sank a jumper. After a Maccabi denied Javtokas in the paint, Trifunovic was slapped with a technical foul for something he said to the referee. 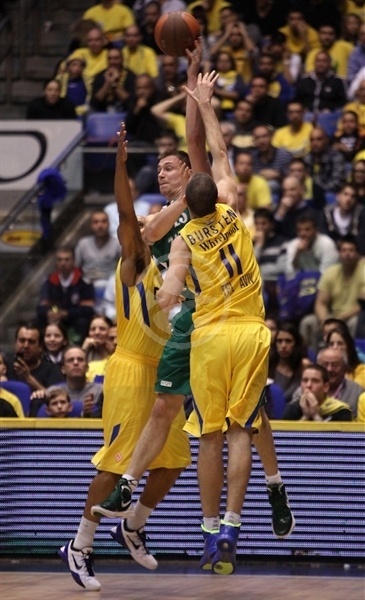 David Blu netted the resulting free throws and Papaloukas made a pretty dish to Hendrix as Maccabi got within a basket. 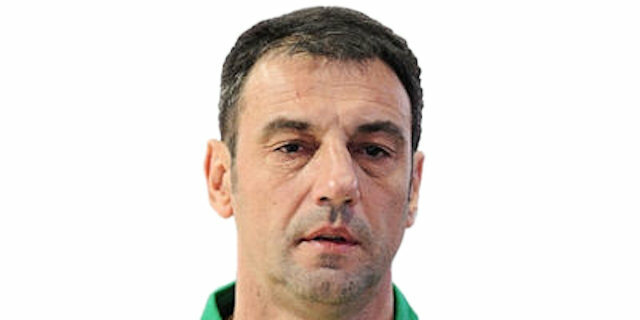 However Popovic lifted the Zalgiris edge to 33-37 at the half. Schortsanitis scored down low in the first minute of the second half, but some good and aggressive defense kept the ball out of the basket for more than two minutes until Salenga came through for Zalgiris. Weems extended the Zalgiris lead to a more comfortable 35-43 midway through the quarter. Rakovic hit a jumper to extend the lead to 10. 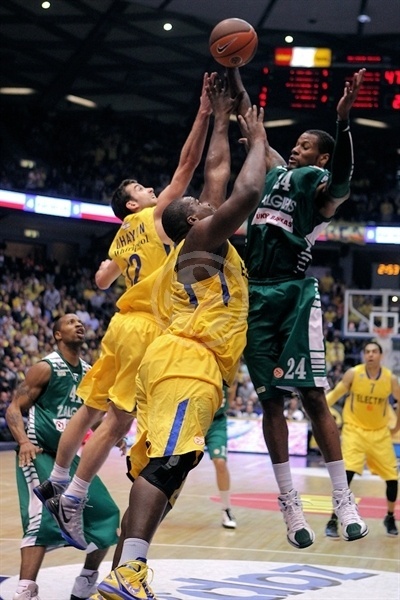 Big Sofo retaliated with a slam, but Weems kept Zalgiris rolling with free throws to get to 37-48. However a clutch triple from Blu and a Papaloukas pass to Hendrix kept Maccabi as close as 44-49 through three quarters. Langford opened the fourth quarter with a drive through the Zalgiris defense for a basket-plus-foul to make it a one-possession game. 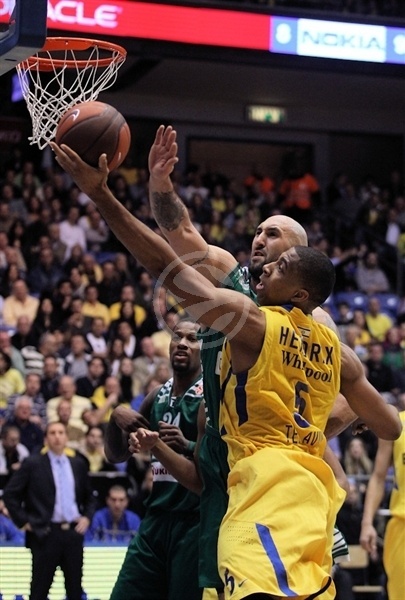 Then Devin Smith sniped a three-pointer for his first points of the game and Maccabi’s first lead. Weems answered back only to see Hendrix match him. Then Blu connected from deep to make it 55-51 as Nokia Arena was rocking. After a timeout, Popovic netted a big three to close the gap to 1, but Langford shined with a pull-up triple. Smith buried another big three as the momentum was clearly with the home team, 61-54. Collins kept Zalgiris close with a three, but Hendrix answered with a rare jumper. Then a Salenga basket from behind the arc trimmed the gap to 3. A poor pass by Papaloukas led to a Salenga fast break slam. Zalgiris looked ready to regain the lead on a Javtokas slam, but Smith soared to cleanly block the shot. 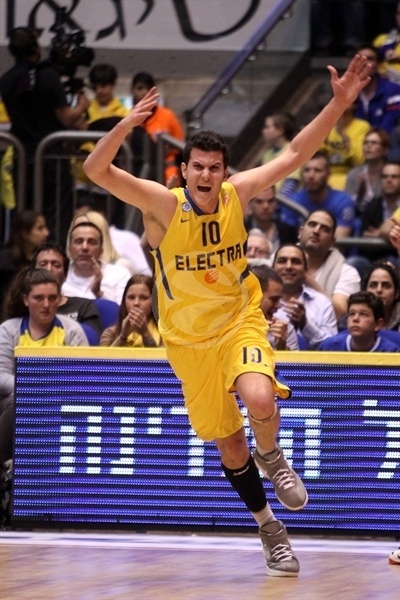 Yogev Ohayon lifted Maccabi to 65-62 from the line with three minutes to go. Schortsanitis missed 2 from the line, which opened the door for Zalgiris again. Weems put Zalgiris ahead 65-66 with 1:42 to play. Langford free throws put Maccabi ahead once more and then after the hosts came up with a stop on defense, Langford weaved his way through the Zalgiris defense for a layup and a 69-66 lead with 24.1 seconds left. Weems went for an open three, but Smith flew in to block the shot and tried to take it in for a slam. But he missed the dunk, Zalgiris recovered and Weems tried again, but missed from downtown. This time Hendrix corralled the rebound, was fouled and iced the game with a free throw with 7 seconds left. "It was a great battle between two teams that still fight in the Top 16. We fought very hard not to have any decline in our intensity but it didn't work as we saw especially in the first quarter. Not many teams can come back as we did today. We opened bad and came back in the second quarter and that hurt us in the third quarter because we were very tired. We got up from the floor time after time like Rocky. Papaloukas saved us today. Like other great superstars he steps up in the right time." "I said from the start of the Top 16 that we want to be competitive in every game and that's what we did, but today we should have won. Small details make a difference in such game. 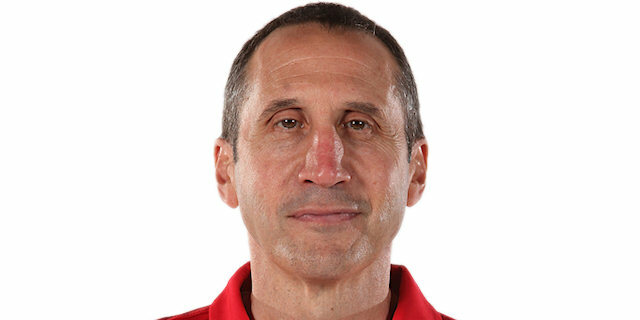 I don't allow anyone on our team to be frustrated and that's what I told my players in the locker room after the game." "I think we all played well. I tried to do my best and it worked out. defense saved us today. The most important thing is that we won. 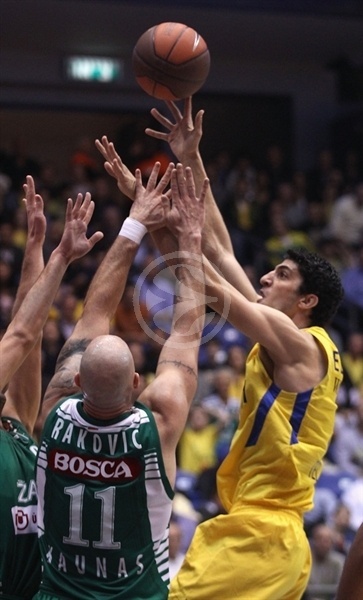 We came back from 17 points behind and if we had lost it could have cost us the Euroleague. It was one of our best game today because we showed great mental toughness. I have great support from everyone all the time. I want to thank the fans wbo supported me from this start. I don't know if I'm worthy for this support but I'm happy to get it." "When you lead by 17 points in the first half, as we did here, you don't think that you're going to lose the game. In the second half we didn't attack as well as we did in the first half. They made a great comeback, but we still had a chance to win and we missed it. The balance between the bigs and the guards wasn't as good as it should be. It's a real shame, because we were very close to winning tonight."